Have you heard the news? It's right here on the front page: Masked Bandit Robs Another Train. But instead of holding the purser at gunpoint and demanding the combination for the safe, it says that she politely asked for a sandwich and then left. Weird! At first they didn't know what she had taken, but they soon discovered that she had stolen the hearts of everyone on board! The police sketch artist reviewed the eyewitness reports and made a drawing that looked a lot like this Toddler Sweet Raccoon Costume. And in the interest of public safety, we've decided to make these lookalike outfits available in the largest possible quantities. Because if all criminals were more like this latest mild-mannered miscreant, the world would be a much better place! 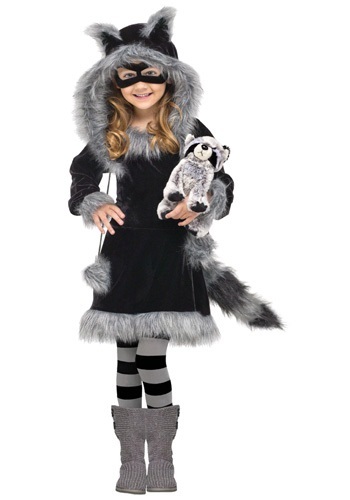 If her outfit was anything like this one, it must have had a convenient slip-on design with a sewn-on hood, and it was probably lined with grey fur trim. Almost everyone noticed her black-and-grey faux fur tail as well! And that might have had something to do with her matching striped stockings. Technically, if you see anyone wearing an outfit like that, you should probably alert the authorities. But—and this is just between us—it might be better for everyone if you simply tell her to keep up the good work! We don't usually leave lawbreakers on the loose, but somebody with her sense of style seems bound for bigger and better things!